Martinet's video game voice over debut was as Mario in the 1995 Windows release of Interplay's game Mario's FUNdamentals. However, most were first exposed to Mario's voice in the landmark 1996 game Super Mario 64. He has voiced Mario, Luigi, Wario, Waluigi, Toadsworth, Baby Mario, and Baby Luigi in most games where in these characters speak. 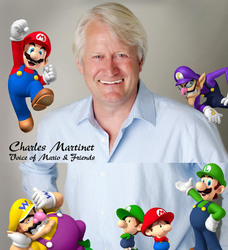 His voice work appears in the English and Japanese-language versions of the games, albeit his work is always in English (regardless of the Italian references whenever he voices Mario and related characters). Martinet also provided voiceover acting for the boxers and the announcer in the Super NES title Super Punch-Out!!. He also voiced the character Vigoro in Sega's Dreamcast and Nintendo GameCube RPG, Skies of Arcadia.